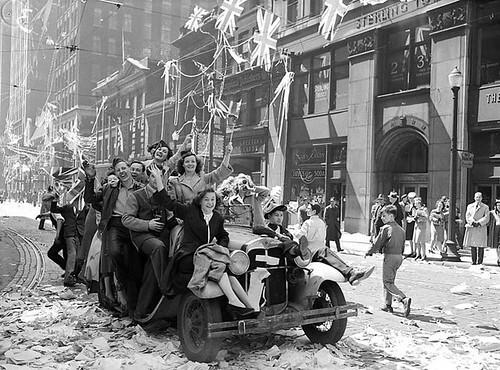 This photo was taken by the Sterling Tower at 372 Bay Street after the end of World War II. Well well, I didn't realize Toronto was an anarchist third-world country back then. Look at all that litter on the street! And how about that vehicle? It's like one of those commuter trains in Mumbai with people hanging on to the sides. And clearly they're in violation of the law since there's no license plate. And shouldn't that boy on the right be in school? Clearly that man in the back with the trenchcoat is a pervert. If you look closely he's got one of those John Waters pencil-thin moustaches. The only thing that's calming about this photo is that it's all white people. Thank Jesus for that! Don't forgot the streetcar tracks. We all know streetcars are evil! Nothing like a day in the trenches. That car must be the one that they used on the Beverly Hillbillies. I wonder what percentage of those people are still alive. Even that kid walking by near the front of the car would be in his 80s.